Last night I made what I thought was a witty comment on Facebook that did not receive the response I expected. In my comment, I referred to myself as a fat girl. This was not intended to be self deprecating, nor was I expressing shame at who I am. I know how hard I've been working out. I won't be fat forever, I just am right now. It's a fact. Nothing more. So why did I receive the criticism? The reasons I thought up was that maybe people misread my remark as me being sensitive about my weight. Or maybe they felt I was making fun of fat people (I wasn't). Whatever the reason, it became very clear that "fat" is just a bad word, even when you're talking about yourself. And this makes me kind of sad. I especially get sad when I read fashion magazines and find the advice for "all shapes and sizes" to be horribly deficient. They have models who are skinny, tall, curvy, bootylicious, and boobylicious, but some of us aren't any of those. Some of us are simply fat. Even the self improvement magazines like Self and Shape can't throw us Works in Progress a bone, even though they know we make up a large part of their readership. I know what will look good in me when I get thin; but what can I wear when I'm not quite there yet? The term "plus size" and "shapely" just sound dregrading and decietful, too. I'm not saying we should go around calling everyone fatties. That would be rude. But sometimes the other words out there aren't correct. Why can't we just call it like it sometimes is: fat? 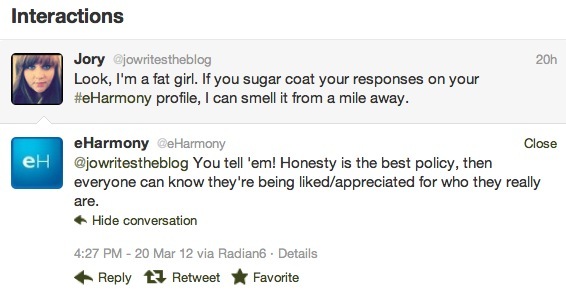 For the record, this is what I said, and thank you to eHarmony for understanding my meaning.